Anil Agarwal, Chairman and founder of Vedanta Resources, has worked his way up from scrap-metal dealer to billionaire with a home in London’s Mayfair and another in Mumbai. The tricks to his trade have been to buy cheap second-hand industrial plants, and newly-privatised companies at low prices. With increasing wealth has come increasing power. Mr Agarwal donated considerable sums to the two biggest political parties in India. The advisory committee of India’s Supreme Court has stated that the way in which Vedanta’s Lanjigarh refinery secured environmental clearance ‘smacks of undue favour/leniency’. A top panel of experts put together by India’s Environment Minister has described the ‘appalling degree of collusion’ of local officials with Vedanta’s ‘total contempt for the law’. Mr Agarwal’s empire – Vedanta Resources – now spans four continents, with offices in London and operations in Zambia, Australia and India. He owns more than 50% of the shares in the company, earning him a place among the richest thirty people in Britain. Vedanta Resources was criticised by the UK government for not having a human rights policy. The government said ‘a change in the company’s behaviour’ is ‘essential’. Due to the mounting tribal protests and international criticism of their actions in Orissa, India, Vedanta initiated a PR offensive extolling their virtues. But this short film reveals how easily their lies and manipulations can be debunked. The Indian government has now put a stop to Mr Agarwal’s mine on the Dongria’s land, by refusing to issue the necessary clearance. 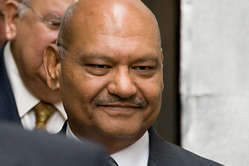 In January 2009, Mr Agarwal said that mining would begin ‘in a month or two’.